Abortion is one the most controversial and highly charged moral/political issues of the last quarter century, and still remains a hotly debated topic in the public square and even in the church. Since that day in 1973, when the U.S. Supreme Court struck down state abortion laws (Roe v. Wade), over 48 million lives have been stolen in the womb. Because this is literally an issue of life and death, a biblical understanding of the concepts that inform the abortion debate is imperative. The preliminary theological consideration involved in this debate is that human beings are created in the image of God. Further, because humans are created beings, their creator has absolute rights over them. Therefore, taking the life of another person is a serious offense. In Genesis 1, God says, “Let us make man in our image, according to our likeness . . . God created man in his own image, in the image of God he created him; male and female he created them” (1:26-27), and God “blessed them” (1:28). This reality is the basis for the command the LORD gives to the Israelites on Mount Sinai, “You shall not murder” (Exodus 20:13; Deuteronomy 5:17). Moreover, people were created for a purpose, namely, to glorify God: “Everyone who is called by my name, and whom I have created for my glory, whom I have formed, even whom I have made” (Isaiah 43:7). Humans are created "in his image," and "for his glory." This anthropological foundation is the basis for answering the question, “When does this ‘life’ begin?” The abortion debate hinges on this question. If life begins at birth, then abortion loses its horror. However, if life begins at conception, then abortion involves forcibly taking the life of a genuine human being. In addition to scientific evidence (e.g., early viability; beating heart at three weeks; brain waves at eight weeks; the ability to feel pain at nine weeks), the testimony of Scripture is that life begins at conception while still in the mother’s womb. 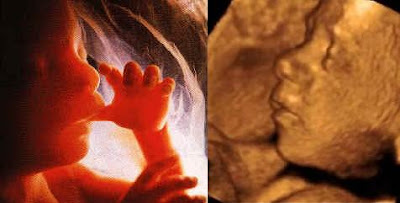 This reality is seen primarily in the way that biblical writers speak of the unborn child. God is seen as sovereign in conception. The Psalmist, for instance, asserts, “You formed my inward parts; you wove me in my mother’s womb . . . My frame was not hidden from you, when I was made in secret, and skillfully wrought in the depths of the earth; your eyes have seen my unformed substance” (139:13-16). Unborn babies are spoken of as actual people. In Genesis, after the LORD answered Isaac “and Rebekah his wife conceived,” the writer relays that “the children struggled together within her” (Gen 25:21-22). In the book of Ruth, Naomi speaks of her barrenness by saying, “Have I yet sons in my womb, that they may be your husbands?” (1:11). In one of Job’s laments he contrasts the day of his birth with the night he was conceived saying, “And the night which said, ‘A boy [man-child] is conceived’” (Job 3:3). He further describes a miscarriage as, “infants that never saw the light” (3:16). When Eve conceived and gave birth to Cain, she said “I have gotten a manchild with the help of the LORD” (Genesis 4:1). Luke records that Elizabeth “conceived a son” and then later “gave birth to a son” (Luke 1:36, 57). There are many other biblical texts and scientific facts that inform the abortion debate, but these two theological principles provide a strong foundation for engaging this critical issue. Abortion Changes You, a site designed to help Abortion's "secondary victims"
"Dr. Suess on the Nature of Personhood"